When shopping for a 1080p projector in today’s market, it can be difficult to identify which brands offer the best value for the price you pay. This is an especially important issue to figure out, as the purchase of a projector represents a large investment in your home entertainment center setup. Sorting through the dozens upon dozens of suggested projectors on the websites of major electronics retailers can be a daunting task, and typically leaves consumers will more questions rather than effective answers. 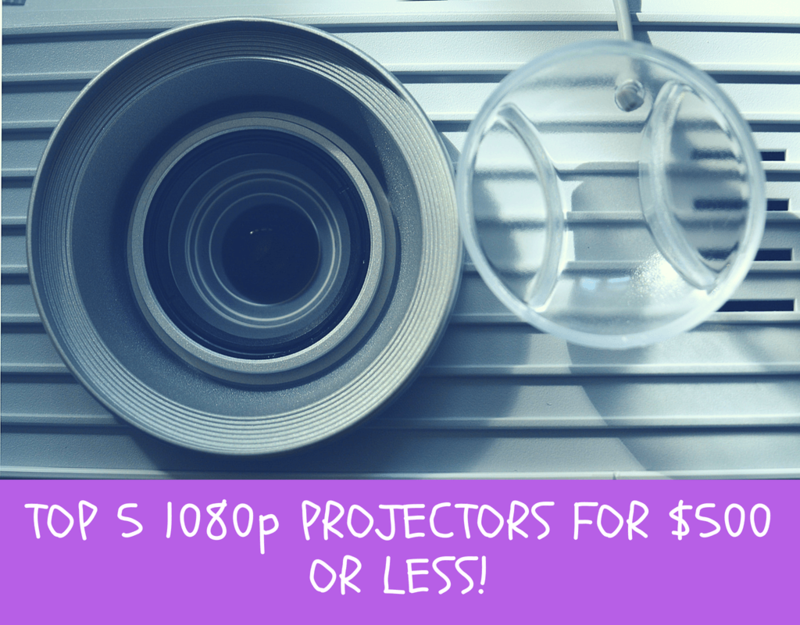 With this shopping environment in mind, we have taken the time to curate a list of the top projectors selling for $500 or less today. While some of these projectors may have display resolutions higher than 1080p (also known as “full high definition,” or “full HD”), each product on this list managed to pass our review process, indicating that their image quality is enough to satisfy even the technophiles among us. Each of these projectors will be judged on three key criteria: Brightness, Image Quality, Unique Features. Our first two areas of review are self-explanatory, while the third, Unique Features, will focus on the specialized technology that sets each projector apart from its competitors. By going in-depth in these areas, it is our hope that consumers will leave our blog feeling better informed about how to go about investing in a high quality yet affordable projector. Without further ado, let’s jump into the review and see what the first unit has to offer. The ViewSonic PA503S is highly regarded within this price range. With a strong combination of crisp image quality and high customer satisfaction, this unit may seem like a no-brainer after a quick glance while shopping online. But how does it really measure up in terms of our specific review criteria? Brightness: With a brightness of 3,600 ANSI Lumens and a 22,000:1 high contrast ratio, this projector is guaranteed to produce clearly visible images in almost any presentation environment. Believe it or not, this visibility also extends to rooms that have high levels of ambient light, making this a particularly good investment for those having to consistently deal with open windows or unavoidable natural lighting. The lamp bulb utilized by this projector is also guaranteed a longer lifespan, thanks to a number of different projection modes that somehow manage to avoid compromising the overall quality of the image at the same time. For example, when the projector’s Power Saving setting is on and there is no type of input signal detected, the projector will automatically switch to a mode that saves a significant amount of lamp bulb time – which ensures that users save a significant amount of money in the long run. 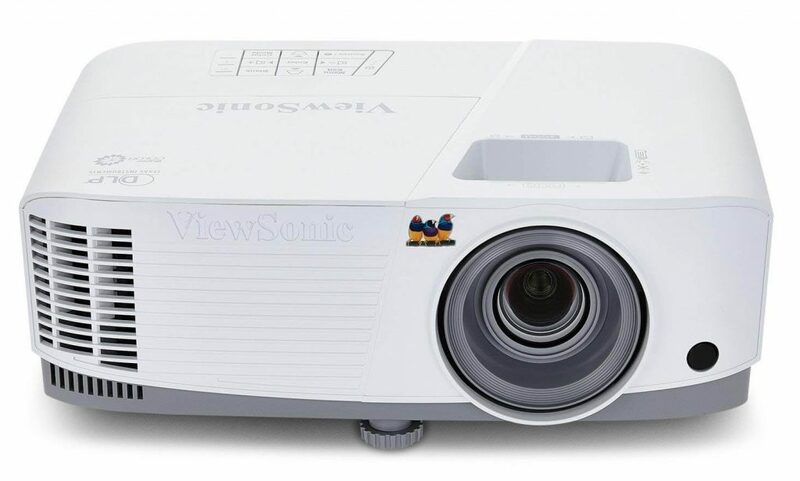 Image Quality: With the ViewSonic PA503S, a no-frills yet crisp image quality combines with a number of notable features that make this projector a great choice for those who want to combine home entertainment functionality and on the go presentation readiness in one single device. Users have raved about the image quality, with many saying that it allows for viewings that are of comparable quality to those created by far more expensive projectors. Unique Features: The target market of presentation givers is made clear by the inclusion of capacity for up to 8 different remote controls to be utilized at once on this projector. This feature – while far from mainstream – could help teachers and professors engage classrooms with multiple choice questions peppered throughout presentations. ViewSonic’s proprietary SuperColor Technology is impressive, to say the least. This allows for a wide range of visible colors, ensuring that users are able to enjoy more realistic and accurate video projection in both bright and dark environments without ever having to sacrifice image quality. 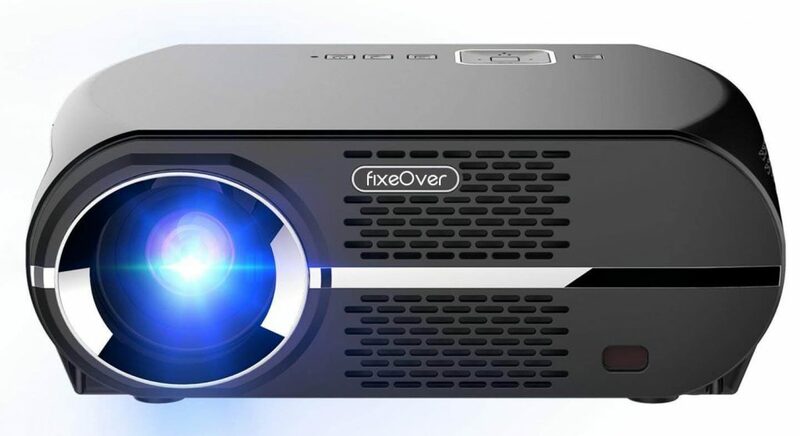 The FIXEOVER GP100 (formerly VIVIBRIGHT GP100) is a great choice for those looking to buy a modern, feature-rich projector without breaking the bank. Whether for video games, movies, presentations, or marathon Netflix sessions, this projector offers all of the features and amenities that consumers these days demand from their products. Brightness: This projector has been found to be plenty bright for almost any setting in which it would be utilized. With a bulb rated at 3500 ANSI Lumens, enhanced brightness and clarity are guaranteed. Better yet, the light source utilized in this model is LED-based, meaning that it is not only low-power and eco-friendly but versatile enough to be put through its paces while still operating properly. Overall, the brightness of this unit guarantees a crisp, inviting image, regardless of the location in which it is being used. Image Quality: Overall, the video quality of the GP100 is enough to impress even the biggest skeptics. The resolution is full 1080p and appears to bring and crisp on any wall or surface. However, there have been reports of color profiles in certain images appearing flat, which means that some images might not appear to “pop” as much as one would like. Still, the projector is powerful enough to do well even in bright rooms. While there are instances of occasional blurring on the corners, this is easily fixable by switching out HDMI cables until the problem is resolved. Unique Features: As a no-frills projector, there aren’t any notable technical specs to point out here. However, the GP100 has arguably one of the sleekest designs on our list, which gives it extra points when it comes to product styling. While this unit does not scream “premium,” it has everything one needs to bring the movie viewing experience home, making it the perfect choice for those who don’t want to break the bank. Coming in just shy of $500, this projector just barely makes it onto its list. While the audio on this model has been found to be just short of awful (which isn’t a deal breaker in most situations thanks to external speakers), the picture quality is strong and bolstered with 3D content capabilities. Brightness: With a bulb rated at only 3,200 ANSI Lumens, one could be excused for believing that the brightness would be less than stellar for this unit. However, users have reported a high-quality projection when used for even longer periods of time, which goes to show that there is more to the brightness quality of a unit than captured in a simple benchmark rating. Image Quality: Good, yet not great. The image quality of this unit comes in at barely full high-definition quality. With this being said, there are plenty of more affordable units out there that offer a better viewing experience. Focus and zoom settings are limited, with a modest 1.1x zoom allowing for just enough adjustment to achieve a clear picture in most situations. With image quality comes cable support, and thankfully this model has consumers covered. VGA, HDMI, RCA jacks, and S-video ports are all included, ensuring that you will be able to display your content regardless of the connector’s formatting. Unique Features: The most notable extra feature included with this model is its widespread support for 3D content. While users will still have to buy specialized glasses to fully enable this content format, simply having the option to play movies and video games in 3D utilizing a projector in this price range is exciting. This projector is able to project 3D content from a PC over a VGA connection, or from a Blu-ray player or set-top box over its various HDMI ports. Needless to say, having the ability to project content in 3D via multiple different connection standards certainly helps to boost the versatility of this budget-minded projector. Epson has long been one of the industry leaders in projector technology, and it’s easy to see why this is the case with this particular model. With a simple to understand setup and a number of connections supported, this projector is a great choice for anyone in the market for an affordable, high-quality projector. Brightness: This model is rated for 3,200 ANSI lumens, meaning that it represents best-in-class brightness as far as this metric is concerned. This means that consumers will be able to enjoy the high-quality image produced by this unit in any setting, bright or dark. A strong bulb brightness is combined with one of the best contrast ratios on our list (i.e. 15,000:1), making it very easy to get really high-quality images on screen, even with darker or less vibrant media forms, such as black and white pictures. Image Quality: In short, this projector has the best image quality of any model present on our list. The brightness and contrast ratio mentioned above combine with a full high definition resolution to provide one of the best looking pictures available via any projector at this price point. This model is more than suitable for projecting everyday presentations and graphics and may actually provide a bit too much capability for these mundane tasks. Gaming and full HD movies and videos look amazing with this projector. For customers most concerned about projectors being able to keep up high-intensity gaming, we strongly suggest this product, as it offers the “best of both worlds” when it comes to providing an impressive image quality for both video games and movies. Unique Features: The interesting fact about this projector is that it does not really manage to stand on when it comes to features alone. While the setup process is specially designed to be fast and easy for all users, that is really the only special feature that we were able to denote throughout our intensive review process. Overall, we strongly suggest this projector for anyone looking to maximize their return on investment with a high quality and extremely easy-to-use projector. With a strong list of technical specifications, a reasonable price point, and an attractive form factor, the Epson VS250 offers more than enough to convince casual videophiles and everyday film fans to make this projector a part of their home theater setup. Thanks to the fact that the Epson VS250 packs full HD video into an extremely affordable form factor, this will likely satisfy any cost-conscious audiophile’s urge to build their own epic home entertainment system. This is an exciting conclusion to come to, as Epson has done a great job of ensuring that those on a budget have access to a great projector system. Known for their dependability and steady improvements, this Epson model comes close to being the best budget-minded projector that we have seen at the under $500 price point. This exciting fact combines with an impressive video quality that is enough to satisfy even the most sensitive videophile. Featuring HDMI, VGA, and RCA video inputs, multiple different source devices are supported, helping to bolster the fact that the Epson VS250 is a solid choice for any existing home entertainment system.